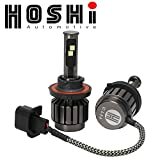 We are very confident in the quality, performance and design of Hoshi Automotive LED headlights, confident enough to offer a LIFETIME warranty. We source only the highest quality components, periodically inspect our production facilities and implement strict quality controls. Hoshi Automotive is an American company. Founded and operated by two Marine veteran brothers. One an electrical engineer and the other an accountant. Product design, quality control, marketing, management and customer service all accomplished with 100% American employees. The internal moving parts (most important for reliability/performance) are sourced from Japan and the assembly in China. What is the Lumen (Lm)? 1.) THEORETICAL Lm: A mathematical calculation based on LED components. 2.) HEMISPHERIC CHAMBER: a large, semi-sphere machine that tests Lm at multiple wattages over specific testing intervals. Obviously, the most accurate option is the hemispheric chamber; however, most advertised ratings are theoretical ratings. Every HOSHI LED bulb fitment is tested in a hemispheric chamber. We stand by our ratings and will happily provide our results! • PLEASE CONTACT US WITH ANY INSTALLATION ISSUES AS MOST HAVE SIMPLE SOLUTION AND WE APPRECIATE THE OPPORTUNITY TO ASSIST. • IN A FEW VEHICLE APPLICATIONS EXTERNAL DRIVER MAY BE REQUIRED. WE PROVIDE UPON REQUEST. • RUNNING WITH DUST COVER WILL CAUSE DECREASED PERFORMANCE, EFFICIENCY AND RELIABILITY. • WARRANTY MUST BE REGISTERED IN THE TIME AND MANNER PROVIDED WITH YOUR PURCHASE. EXTREMELY BRIGHT WHITE LIGHT - Clear 6K 6000K true white light @ 8,000 Lm and 30 watts. Solid beam light with constant and even light distribution. 5 Times Brighter than Halogen Lights! JAPANESE INTERNAL MOVING PARTS / COOLING SYSTEM - dual ball bearing, 9,000 rotations per minute HIGH SPEED internal fan ensures extreme airflow, super low heating and much higher efficiency. Can withstand working temperatures between -40F to 250F. DESIGNED TO RUN WITHOUT DUST COVERS FOR BEST AIRFLOW, PERFORMANCE AND RELIABILITY. WEATHER RESISTANT AND SHOCK PROOF - Water, shock and heat resistant. Headlights built and tested with performance, quality and design in mind. NOTE: DESIGNED TO RUN WITHOUT DUST COVERS. REPLACING DUST COVERS AFTER INSTALL WILL BLOCK AIRFLOW, DECREASE PERFORMANCE AND CAUSE RELIABILITY ISSUES. INDUSTRY LEADING LIFETIME WARRANTY - Purchase RISK-FREE. We stand by all our products and customer satisfaction is our top priority. Install once and never think about again. Just purchase, register warranty on our website and enjoy a LIFETIME of top quality lighting. NOTE: DO NOT REPLACE DUST COVERS AT INSTAL. DUST COVERS LIMIT AIRFLOW, PERFORMANCE AND RELIABILITY.